Making sure you choose the right programme of study for you in the Sixth Form is probably the most important decision you will have to make in the coming months and the choices you make now could influence your future career. While it can be very tempting simply to choose subjects you enjoy and which interest you – and these are very important factors – it is also important to think further ahead and consider what you might want to do in the future. It is therefore absolutely vital that you think very carefully about your academic strengths and interests, do your research and seek advice. We offer 27 subjects in The Polesworth School Sixth Form @ Tomlinson Hall. We expect students to study four subjects in Year 12 and most will elect to continue studying all four in Year 13 at A2. We are a full-time educational establishment and do not admit students on a part-time basis. We do not expect students to take fewer than 3 subjects in Y13. Who should make the decision about my choice of subjects? You. However it is such an important choice that you should consult others. Consult your parents/guardians. Remember you need support from your parents for at least the next two years so it is important to discuss your choice with them. Consult the school. The requirements of Higher Education have changed and are still changing so ensure that you act on very up-to-date advice. Consult careers staff. Remember – to be successful you must build on strength. How do you choose your A Level Subjects? 1. Your ability in the subject concerned, or one closely related to it. For example, if you are considering History, then ability in English is useful; if you are thinking of Physics, then Mathematical skill is crucial. 2. Your interest. You will be studying for two years and that is a long time if you do not actually enjoy the subjects you have chosen. You may be looking forward to the opportunity of taking up a completely new subject. However, if this is the case, then make sure you know exactly what that subject entails, the topics you will be studying and the scheme of assessment. 3. Your career aims and ambitions. You may need to study particular subjects for certain careers, eg, medicine, dentistry, veterinary science. Science, Computing and Engineering related degrees require Maths at GCSE (grade C or above) and often at ‘A’ level. If you want to go into primary school teaching, then you should be looking at taking at least 2 national curriculum subjects. If you are unsure what subjects you need, then please seek help from careers staff and/or subject teachers. If you do not have a particular career in mind, then the combination of subjects chosen at ‘A’ level can be based solely on your interests and ability – but make sure that you choose a programme of study which keeps your options open. REMEMBER: There are thousands of different degree courses available in Higher Education and very many of these can be studied without you having a GCSE or an advanced level qualification in them eg. Computer Studies, Law, Economics, Criminology. However, the results you achieve at the end of Year 12 will be of vital importance. Over 75% of our students apply for university and in The Polesworth School Sixth Form @ Tomlinson Hall we have an extremely good record for helping our students secure their places at university. There are many reasons for moving into Higher Education after completing ‘A’ levels. For many students it is a vital step in order to pursue their chosen careers; others develop a real interest in a subject area and want to study it further; some are still uncertain about a specific career but believe a degree will improve their chances of getting a good job and many feel that the whole experience of University will give them opportunities they would not otherwise have. 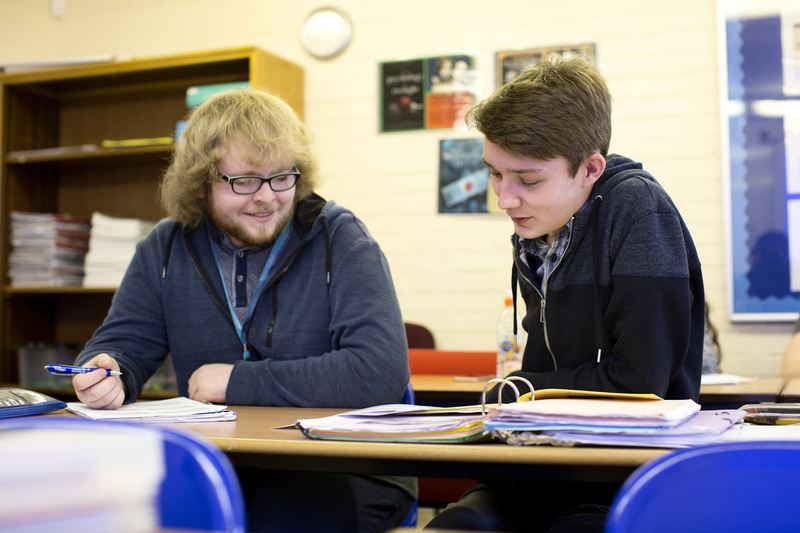 The process of applying for University begins early and in The Polesworth School Sixth Form @ Tomlinson Hall we provide plenty of help and guidance, through Higher Education Information events, visiting speakers, Open Day visits and tutorial work. University applications are made through UCAS (Universities and Colleges Admissions Service) in the Autumn of Year 13. Students wishing to apply to Oxford, Cambridge, medical or veterinary courses have to submit their forms by 15th October and for all other Universities by 15th January. Admissions Tutors will be looking at results of AS exams gained at the end of Year 12 as well as GCSE results in order to make offers of places to students. As a Year 11 student, if you already have plans to go to university and have in mind a particular course, then you should check out the entry requirements at www.ucas.com ((The Universities Central Admissions Service – an excellent source of information) before you choose your A Levels. While most degree courses will accept any combination of A Levels, there are some for example – medicine, veterinary science, ICT based courses, psychology which have special requirements. For more information about university, click here. You may have already decided that your own career plans involve progression to Higher Education or you may as yet be unsure. However, you should be aware that your choices of A Level subjects may be critical in determining the university courses open to you. Therefore, if you are thinking of going to university and have a particular area of study or career path in mind, as well as doing some research into individual A Level subjects, you should also be finding out about what the degree courses you may be interested in expect of potential applicants. When you get to the Homepage, click on Search for Courses and follow the instructions as if you were looking for a degree course starting later this year. Here you can find out about what different universities require or what different courses stipulate as their entry criteria. Remember that universities operate their own courses and set their own individual entry policies; no two universities will be exactly the same! All universities have online prospectuses giving more detail about the degree programmes they offer and these are also excellent sources of information. If you have any doubts at all, as well as asking your teachers or Sixth Form specialist staff, you can always contact a university directly for advice – admissions staff are usually more than happy to talk about the policy of their particular institution. Many universities will expect you to take 4 subjects at AS Level with a minimum of 3 of those subjects taken on to A2. You should also realise that universities may ask for a certain number of GCSEs and that they often specify minimum grades in certain subjects. Some universities are now stipulating particular subjects at GCSE e.g. a modern or classical foreign language. Most universities expect students to achieve both English and Mathematics at grade C or above. When applying to competitive universities for highly competitive courses, the more A*, A and B grades you have achieved, the better your chances are of being accepted. Applicants to Oxford or Cambridge generally achieve all A* or A grades as do applicants for Medicine or Veterinary Science. Indeed, some medical courses require a minimum of 7 A* grades at GCSE! For some universities and degree courses, applicants are expected to have done relevant work experience. This is especially true for students applying for primary school teaching degree courses, physiotherapy, medicine, dentistry or veterinary science but work experience can also be valuable when applying for other popular courses – check it out. For many universities and courses, the subjects you take at A Level are not crucial: it is the fact that you have taken A Level qualifications that counts. It is also possible to take many subjects at degree level without having studied them at A Level and Law is a very good example of this. Many universities prefer you NOT to take Law at A Level if you intend to study it for a degree! There are almost endless possibilities of new subjects you can take at university without prior experience – but obviously, when you apply you have to be very clear about why you want to take up a new subject and why you know it is the subject for you. It is also very important to consider which subjects you think you will achieve high grades in as low grades can be just as much a barrier to university entry as choosing the wrong subjects. However, for certain degree courses, particular subject choices at A Level are often required or preferred. Such courses include more obvious areas of study such as science based courses, medicine, dentistry, veterinary science, physiotherapy, pharmacy or engineering. But courses such as ICT, primary teaching, art, music, drama or psychology often demand a particular combination of A Level subjects and for subjects such as history, English literature or law, then certain A Levels can be preferred. A few years ago year the Russell Group of universities, a group representing 24 of the leading universities in the UK, published a guide to making decisions about post-16 education for both parents and prospective students. This guidance was updated December 2013 and can be accessed at: www.russellgroup.ac.uk/informed-choices.aspx or www.russellgroup.ac.uk or simply ‘Google’ Russell Group Informed Choices to get to the guide. The guide gives plenty of excellent information about both GCSE and A Level requirements for students who in the future may be applying to some of the most competitive universities for some of the most popular subjects as well as listing A Level subjects regarded as either essential or useful for different degree courses. However, in the guide it is stated that there are some A Level subjects that are required by universities more often than others and these subjects are referred to as facilitating subjects. By choosing at least 1 or 2 facilitating subjects at advanced level, you will have a much wider range of options open to you at university and such traditional subjects provide an excellent grounding for many degree courses. If you do not as yet have any clear idea about what you might want to study at university or just simply want to keep your options open, then choosing at least 1 facilitating subject is a really sensible plan. Students are therefore advised that if they decide not to choose 1 or 2 facilitating subjects at advanced level, then many degrees at competitive universities will not be open to them. Please consult the Russell group guide and individual university entry profiles. This can all seem quite confusing and a lot to take in at once but it simply means that prospective A Level students have to spend a little bit of time thinking about and researching their A Level options. This is also why we interview all potential Sixth Form students and on our application form ask them to write as much as they can about their reasons for choosing a particular course of study and to indicate whether or not they have any particular career in mind or plan on going to university. We have plenty of experience of university admissions and can help guide students through the decision making process at A Level.